Presents 200 hitherto unpub. astronomical texts & horoscopes written in Greek on papyrus, which were excavated a century ago in the rubbish heaps of Oxyrhynchus, a district capital of Roman Egypt. Through these documents we obtain the first coherent picture of the range of astronomical activity, chiefly in the service of astrology, during the Roman Empire. The astronomy of this period turns out to have been much more varied than we previously thought, with Babylonian arithmetical methods of prediction coexisting with tables based on geometrical models of orbits. Editions of the texts are accomp. by facing translations & explanatory & philological commentaries. The intro. 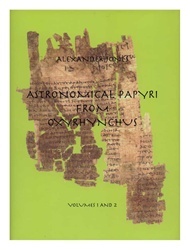 provides the first comprehensive treatment of astronomical papyri, explaining their contents & purpose, the underlying astronomical theories, & strategies for analyzing & dating them. Tables & graphs.